Almost everybody has heard of a Doodler 3D pen, and though the project gained broad popularity, its size ruins all the fun. 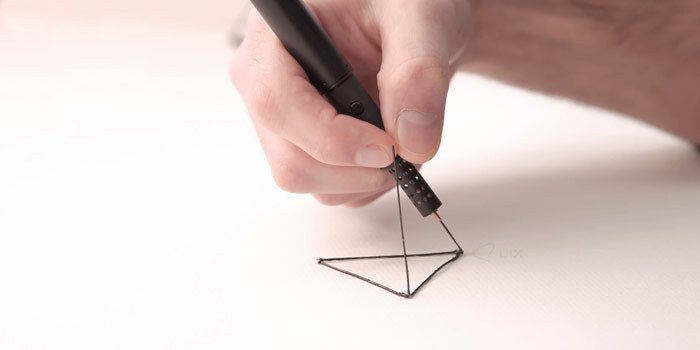 Lix pen is the gadget which provides the creation of 3D objects. It is compact, light and stylish and the size of a usual pen, what makes the creation of 3D objects much easier and joyful. The project start was announced in January 2014, and it has gathered £30,000 on Kickstarter just in 2 hours. The pens will be available in the end of 2014 and could be purchased on the price of 139.95$ in two variants: black matte or white matte. Like the 3D printers, Lix pen melts and cools color plastic to “draw” hard figures right in the air. Two materials are used here: ABS (usually used for these purposes) and PLA (less strong and flexible than the first, but possesses wider range of colors). To activate the pen is simple: adjust USB-cable (127 cm) for example to your notebook and wait till the temperature in the device is optimal, than get to “drawing”. Though Lix pen is twice as expensive as the Doodler one, it is definitely the next step in technology and will be highly appreciated by designers. This entry was posted on Thursday, May 15th, 2014 at 10:50 pm	and is filed under printing, technology. "5 Ways To Print Directly From Smartphone Or Tablet: Near Field Communication"
"Epson Releases New App For Android Mobile Printing"